Leaving for a moment the question of whether or not I am a wolf, I pondered my sheep/sheepdog quotient (sheepdogishness?). Am I one who jumps up to fight and defend those are are incapable or unwilling to help themselves, or am I the one in need of protection? 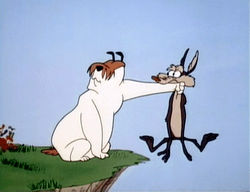 The above cartoon, via characters developed by Warner Bros. and their subsidiaries, depicts the traditional, adversarial relationship between the sheepdog and wolf. As the story goes, Sam and Ralph are quite cordial toward each other before the workday begins, and are similarly friendly after the whistle blows at 5:00pm. However, in-between, they are mortal enemies, fighting each other tooth-and-nail (or tooth-and-claw). Microsoft has recently tried to improve its standing within the computer security industry by hosting a “blue-hat” conference, where various Black-hat and White-hat types gather to help Microsoft improve the performance of its systems under various attacks. In this environment, which brings together some odd bedfellows, Microsoft invites attack and criticism, in hopes of making their systems more immune to those with malicious intent. In computer circles, the White-hats and Black-hats parallel the behavior of Sam and Ralph quite closely. They may behave amicably, but know better than to trust each other too far “during the workday.” The skill sets and abilities may be similar, but there remains a far different set of intentions. This brings me back to the military, and the analogies drawn around the sheep/sheepdog/wolf scenario. In computer circles or within the realm of my expertise, I am trained to be a sheepdog. I am vigilant toward attacks on systems and functions within my area of responsibility, and will take steps to protect them accordingly. Sometimes, my actions my appear similar to those of a nefarious attacker, but my intent is to protect the system, its function, and its integrity. Along the way, there are aspects of my job that some would find, at the least boring, and at the most, quite distasteful. Do I wake up screaming in the night, awakening from a dream of mountains of data laying waste to my family or friends? Well… no. However, I frequently find myself deprived of sleep, poring over minute details of implementation and behavior, all in the name of protection. I am not camped out in a tent in the desert, risking death or dismemberment from an ill-timed move or poor decision. On the other hand, if the system I design has a life-safety or physical security aspect, then I may carry responsibility for the safety and security of civilians just as certainly as any soldier in uniform. Does that make me a sheep? If a sheepdog wields a keyboard and a mouse instead of a 9 mm semi-auto or an AK-47, is he (or she) any less of a sheepdog? Conversely, would we serve our security needs well to put a hardened soldier in the line-of-fire on protecting a facility from bioterrorism or a non-conventional infrastructure attack? The trained soldier may possess these skills, but that’s probably not his or her core-competency. Lastly, the sheep/sheepdog question ought to address the issue of what (or who) is being protected, and what are we protecting against? Who are the guardians of our constitution? Who is ever-vigilant, monitoring the actions of our elected representatives, making sure that they do not, in wolf-like manner, slip into the henhouse, masquerading as a sheep? Glenn Reynolds, the noted political blogger/podcster and mind behind Instapundit, has been keeping all sorts of politicians’ feet to the fire over “political pork.” This would appear to be a case where Trent Lott and Ralph the Wolf exhibit quite a bit of the same behavior, and he’s been caught by Reynolds, part of an Army of Davids. Reynolds, a law professor at the University of Tennessee, doesn’t strike me as a traditional sheepdog, but it’s hard to argue that pedigree when you see a wolf-in-senator’s-clothing in his jaws. Does his law degree and intellectual status preclude him from being a sheepdog? What about his political leanings? The Confederate Yankee would have us believe that “liberalism is a persistent[,] vegetative state.” Are liberals therefore never sheepdogs? Is it impossible for a conservative to be a wolf? The anti-intellectual crowd would have us to believe that what we really need to do is “less thinkin’, and some more killin’.” Sadly, this reminds me all too much of those segments of society that believe “he needed shootin'” to be justification for homicide, and who are uncomfortable with questions about corporal punishment within their home. Regardless of your stance on “liberal intellectuals” or “conservative rednecks,” we would all do well to consider those who act as sheepdogs, in a variety of contexts. Look around. Your sheepdog may be wearing a soldier or policeman’s uniform, or they may be equipped with that same sense of duty and honor, but appear to you as “that IT geek down the hall.” They may wield a gun or they may use a keyboard. They may be skilled at hand-to-hand combat, or they may be thinking machines that can instinctively analyze security risks. Could the soccer-mom that protectively researches the risks of auto-safety be a sheepdog? What about the (derisively-named) tree hugger or global-warming alarmist? What does your sheepdog look like?